The Other Middle Ages introduces selections that cover all aspects and all walks of life, from bawdy songs to somber religious rituals and impudent parodies of the same, from short anecdotes and fables to excerpts from the bestiary tradition. Intermediate Latin students can expect to finish one or more of these enjoyable readings in one sitting, developing their reading skills and giving them a sense of accomplishment. While some selections have been edited for clarity and length, most are unadapted. Notes and vocabulary guide students accustomed to classical Latin through reading medieval texts drawn from a wide range of centuries, geographical locations, and genres. Seventy-nine selections of prose and poetry are grouped thematically: Everyday Life • Echoes of Antiquity—Alexander the Great • The Black Death • Perspectives on Women • Anti-Semitism • Wonders and Marvels • The World of the Church • Ritual • Attacks on the Church • Carmina Burana and Goliardic Tradition • The World of Nature and Science. Kitchell has produced a terrifically useful and enjoyable book. As the "other" in the title implies, this compilation of medieval Latin texts is not a standard anthology of medieval Latin literature in the mold of Harrington's Medieval Latin or Godfrey's Medieval Mosaic, the latter also published by Bolchazy-Carducci.1 Many of the biggest names of medieval Latin literature are unrepresented. Kitchell’s book shares only four texts with Godfrey's much more canonical collection.2 And while Kitchell is certainly keen to inspire interest in further study of the Middle Ages, the book is primarily intended to help "intermediate" (i.e., newly post-textbook) Latin students develop their translation skills through the reading of texts that are more "level-appropriate" than the classical Latin authors, with whom students typically begin their Latin reading careers, such as Cicero, Caesar, Ovid and Vergil. Medieval Latin offers a nearly inexhaustible store of texts that intermediate and advanced Latin students can read with relative ease. Kitchell hopes that more satisfying and less frustrating reading experiences will make for happier and more engaged Latin students and more prolonged careers of Latin study. And if students develop an abiding interest in medieval Latin and the Middle Ages along the way, all the better. In meeting its expressed goals the book is an unqualified success, and I cannot recommend it highly enough. Kitchell has shown superb judgment in selecting seventy-nine fascinating, and often funny, readings. The readings are not arranged chronologically or by level of difficulty, but in eleven thematic chapters, the titles of which attest to the collection’s rich variety: Everyday Life, Echoes of Antiquity—Alexander the Great, The Black Death, Perspectives on Women, Anti-Semitism, Wonders and Marvels, The World of the Church, Ritual, Attacks on the Church, Carmina Burana and Goliardic Tradition, and The World of Nature and Science. Each chapter begins with a short preface, the last of which, on animal lore, is especially fine. There is something for everyone in Kitchell’s collection. And for someone not well-versed in medieval Latin literature (including the reviewer), the book is an absolute revelation, and I suspect that even experienced students of medieval Latin will find more than a few surprises. There is hardly a dud in the bunch. Particularly enjoyable readings include two anecdotes about St. Francis (nos. 40 and 41), a story about a witch’s demise (no. 34), an account of the arrival of the plague (no. 15), an obscenity-filled dialogue between a teacher and student (no. 43), a joke about a cleric's poor Latin (no. 58), a precursor to King Lear’s test of his three daughters (no. 3), and transgressive parodies of the Tridentine Mass (nos. 49, 51 and 53), which are wisely paired by Kitchell with their solemn models (nos. 48, 50 and 52). The last batch of passages, from medieval animal lore, is the book’s best—as well as its largest, consisting of sixteen readings (nos. 64–79). The paucity of passages by female authors is disappointing. Only Hildegard of Bingen is represented, by two passages (nos. 25 and 72). Many of the seventy-nine Latin readings are only a page or so long, with the longest being four pages. Each passage is preceded by a short but informative introduction, providing necessary background on the author and cultural context. The introductions are engagingly written and include useful translation advice, which is addressed directly to the student. Kitchell frequently recommends internet searches (“Faust legend movies,” for example [p. 192]) that will enrich the translation experience. Kitchell also indicates whether a passage has been adapted, shortened or edited; most have been, but often only slightly. Generous assistance is provided in the “Notes and Vocabulary” that accompany every reading. To illustrate Kitchell’s thoroughness (and the audience he is addressing), while Godfrey provides eight notes on all sixty lines of “Stabat Mater” (pp. 212–4), Kitchell provides sixteen on just the song’s first eighteen lines (no. 54). Kitchell’s notes are arranged by line number and very conveniently placed, either on the same page as the text to which they refer or on the facing page. Twenty-six illustrations, mainly of medieval art, are sprinkled among the readings; most are well chosen, clear and appropriate to the text they accompany. The book begins with an Introduction, which explains the goals of the collection and provides a superb summary of how medieval Latin differs from the classical Latin that students will have studied; many of these discrepancies are also pointed out in the notes on each reading (and often with reference back to this summary at the front of the book). The Introduction ends with a bibliography, which includes, among other things, all of the sources of the seventy-nine readings. Kitchell very helpfully indicates which books are available online—the copyright has expired for quite a few of them—and even provides the (often unnecessarily cumbersome) URLs for some. A complete lexicon, including every word that appears in the Latin passages whether glossed in the notes or not, follows the readings and rounds out the book. The medieval Latin summary in the Introduction and the comprehensive lexicon facilitate reading the passages out of order and taking advantage of the collection’s thematic arrangement, even if a little more help is given in the notes on the earlier readings, especially pointing out non-classical spellings (hec for haec, michi for mihi, e.g.) and glossing vocabulary (“the first three times” a word occurs [p. xvii]). My own experience using the book in the classroom has been extremely positive. During the just completed school year I assigned all or part of about a dozen passages in Kitchell’s collection to my 10th-grade students in Latin 2 (the equivalent of the second semester of a university first-year Latin course). My students were able to translate the passages with relative ease, even before completing the textbook (Wheelock). I frequently ended a grammar unit with a passage that had good examples of what my students had just learned. For example, after they studied the comparison of adjectives, they translated “Tongue for Dinner: A Servant’s Revenge” (no. 11). This reading, like many in the collection, also gave the students plenty to think about and discuss. How does the pun on “tongue” work in the story? What lesson is the servant trying to communicate to his master? For many of my students these medieval passages were their favorite readings from the year. Two stories that feature clever, quick-thinking characters were very well received, one about how Alexander the Great’s wife seduced Aristotle (no. 12)—there are also many amusing representations of this episode in medieval art—, and another about a blind man’s wife, who commits adultery with a young man in a pear tree (no. 21). And I know my students will not soon forget the passage about beavers (no. 64). But the reading that left the biggest impression on them and about which they had the most to say was a song from the Carmina Burana that is sung from the perspective of an unwed mother, who is victimized for her pregnancy both at home and in public (no. 63; Carmina Burana 126). This simple and profoundly moving song is, to my mind, the highlight of Kitchell’s collection; I do not know another Latin text like it. p. 11, note on line 34: the note on ipsam refers to ipsam in line 35, not ipsam in line 34.
p. 15, note on line 3: proxime is not the medieval spelling of proximae, but the adverb. p. 25, note on line 2: forestum is not masculine, but neuter and is modified by the preceding quoddam. p. 95, note on line 22: operiri is not from deponent operior, but from operio and is passive. p. 101, note on lines 40-41: desiderati must be genitive singular; it cannot be nominative plural here, at least not for the reason stated, which requires that the perfect passive participle be translated actively. p. 143, note on line 65: misera imposita is nominative and is the subject of disparuit in line 66.
p. 296, note on line 5: Ysengrinus is not the fox’s name, but the wolf’s. These errors aside, I have nothing but praise for Kitchell’s achievement. Reading through the collection has certainly inspired me to read more medieval Latin literature, especially the texts excerpted by Kitchell. And after seeing how successfully and enthusiastically my students translated Kitchell’s selections, I fully intend to make greater use of medieval Latin texts in the classroom, as well, not only because they work well as a bridge between “textbook Latin” and classical Latin literature but also because they are worthy of attention and consideration in their own right. Kitchell’s book will produce many converts to the study of medieval Latin, and I wholeheartedly count myself among them. 1. K. P. Harrington, Medieval Latin. Chicago: University of Chicago Press, 1997. Second edition, revised by Joseph Pucci (BMCR 1998.12.03); A. W. Godfrey, Medieval mosaic: a book of medieval Latin readings. Wauconda, IL: Bolchazy-Carducci Publishers, Inc., 2003. 2. Kitchell nos. 3, 54, 55 and 61. Professor Kitchell’s The Other Middle Ages: A Medieval Latin Reader represents, for him, the manifestation of an ongoing conversation (and collaboration) between himself and his students, Mary Moffitt Aycock, in particular. Conceived, by no means, as the definitive collection of medieval Latin texts for teaching, Kitchell presents this collection as selection of just some of the texts available and appropriate to intermediate Latin students. Moreover, Kitchell argues that medieval Latin may be particularly well-suited for bridging the gap between the “made-up” Latin of our textbooks and the often-complicated Latin of Cicero, Suetonius, and others (xiv). Kitchell posits that the complexity of classical authors, such as Vergil, and the long length of passages that cannot possibly be completed in the span of a night, causes unnecessary frustration for our students (xv). Rather than demanding classical purity, he suggests that we utilize manageable passages of medieval Latin, both in terms of length and complexity, to instill in our students a “sense of accomplishment” and so encourage them to continue their language studies at higher levels (ibid.). In this regard, Kitchell’s position is one in which medieval Latin study becomes an integral part of a classical Latin education rather than an appendix. Kitchell's reader is constructed specifically to "attract more students and teachers into reading medieval Latin" and broadly to contribute to the process of learning the Latin language (xvi). At the same time, Kitchell wants to "show aspects of medieval life often overlooked in traditional ML readers [through] pieces that differ widely in style" (ibid.). The texts edited in this book are fairly short in length—between 10 and 60 lines—and each is accompanied by an introduction providing context and a section of "notes and vocabulary". The selection of readings in this volume, seventy-nine in all, represents a great contribution to teaching Latin. Undoubtedly due to the fact that this reader reflects the work of countless exchanges between students and teacher, Kitchell’s choice of readings is excellent. A smart mix between serious matters and delightful anecdotes, the variety of styles and genres should keep even the most reluctant Latin learner engaged. The short introductions to each selection are also masterfully crafted, giving just enough context to get the reader started without spoiling the finer points of the narrative. The passages are well glossed, with notes giving hints and clarity to the text without ruining the reader’s ability to uncover meaning for herself. The seventy-nine readings are broken into eleven sections. There does not seem to be any particular rationale behind the ordering of the sections, nor is there a clear pattern in the difficulty of the readings or the chronology of the authors. Nevertheless, the clear presentation of each reading and the helpful apparatus of notes and vocabulary outshines the rather loose nature of its thematic structuring. With some care, readers and instructors should be able to pick and choose readings with relative ease, so long as they remain conscious that notes to subsequent readings sometimes build upon, or depend upon, prior readings in the collection. In addition to the notes to each text, Kitchell’s "Introduction" provides important general resources to the intermediate Latin student without becoming too overbearing (seemingly the guiding theme of this volume). He provides a discussion of how to use the reader, a short introduction to "Medieval Latin", and a limited discussion of how medieval Latin departs from classical models in terms of orthography, grammar, and syntax. This discussion should prove helpful to students approaching medieval texts, such as those edited in this reader, for the first time. It was not entirely clear, however, to what end these notes were constructed: does Kitchell want students to understand where medieval Latin "loses" qualities and becomes "less precise" than classical Latin, or does he want them to recognize differences in a developing language? The texts selected for this reader are intended for an intermediate student of Latin, and so Kitchell assumes a background of vocabulary appropriate to that level. While all Latin words within the reader are glossed in the Lexicon, only those assumed by Kitchell to be new to the student are glossed at the end of a passage. Kitchell makes this distinction based on the word list of the former New York State Regents Latin Exam, a standardized test for high school students (xvi). Latin words with "obvious English derivatives" are also not glossed in the accompanying vocabulary lists for each text. If medieval grammar differs from classical grammar, this difference is provided in the first three instances when it occurs. Kitchell’s goal is readability and immersion: he wants his students to read and to figure out the text rather than to rely wholly on glossaries and editorial notes. The central question with which I was left, having first read through Kitchell’s introduction to his material and then the passages that he has edited, is the following: what does Kitchell want students to think about medieval Latin vis-à-vis classical Latin? Kitchell opens his book with a strong case for using medieval Latin as a tool to bridge the gap between the introductory "made-up" Latin of textbooks and the complex Latin of classical authors. On the one hand, he introduces medieval Latin as something derivative, a vulgar version of something more beautiful, a stepping stone on the path to a greater prize; on the other hand, he presents medieval Latin as the vibrant language of a rich and exciting period of history. While I think that his reasoning behind teaching medieval Latin to intermediate language students as a means for exposing them to more advanced, but still readable, Latin is valid, I cannot help but wonder as to his presentation of medieval Latin as such. Moreover, while I understand Kitchell’s decision behind providing shorter passages in order to encourage the sense of accomplishment that students feel when finishing a translation, I think that a limited selection of longer passages would also help to prepare intermediate students for more advanced work. 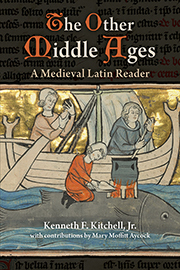 Overall, Kitchell’s The Other Middle Ages: A Medieval Latin Reader is an important contribution for teachers of Latin, particularly teachers of medieval Latin. The presentation of his selections, edited and with a readily available set of glosses, provides relatively pain-free entry into the medieval Latin world, which should be appreciated by both student and teacher alike. Kitchell rightly praises his students for helping him to construct a valuable tool for Latin language learning, and we should likewise praise both them and him for his contribution to our classroom. The Other Middle Ages: A Medieval Latin Reader is a text created especially to help intermediate Latin students gain a greater command of the language. Seventy-nine selections of Latin prose and poetry are thematically grouped, with notes and vocabulary-building information. A "how to use this book" set of guidelines and an extensive lexicon round out this excellent resource from award-winning instructor Kenneth F. Kitchell, Jr., professor emeritus of classics at University of Massachusetts.